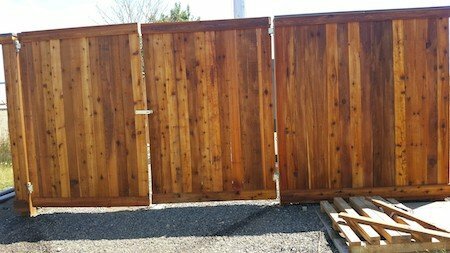 Staining a Wood Fence | Pacific Fence & Wire Co. Treating an old wood fence with a protective stain will not only keep your fence looking great, it will protect it from the elements. There are several ways to stain a wood fence including a paint brush, roller or paint sprayer. For larger projects, it may be worth the money to invest in a quality sprayer, as it will make the job go much faster. For smaller projects, staining a wood fence with a simple roller and paint brush for those hard to reach areas should work just fine. Reignite the glow of cedar boards by learning how to stain a fence. It requires just two basic steps: cleaning and staining. When Is the Best Time to Stain a Fence? Wait a few weeks before staining a new fence. Why? Wood is affected by light, temperature and humidity. It needs time to adapt to its new environment. Treating an old wood fence with a protective stain will not only keep your fence looking great, it will protect it from the elements. Early or late summer are good times to stain a wood fence. You’ll need a few days of dry, warm weather, both before and after you stain. The boards need to be completely dry. A cloudy day, early in the morning or late in the afternoon are good times to work. In general, it’s better not to paint in direct sunlight. You won’t have to wait long for a cloudy day in Oregon. Follow the manufacturer’s recommendations for temperature range. Why Stain a Wood Fence? Treating your fence protects it from rain, sun and rot. Cedar naturally resists mildew, but a finish gives it more staying power. When the boards are protected against moisture, they’re less likely to warp. Staining also restores the look of cedar that has turned gray and dingy. Choosing a stain is the biggest decision you will have to make when staining your wood fence. There are so many variations of stain offered and big box retailers offer generic brand stains at an affordable price. Remember though, as is the case with so many things in life, you get what you pay for. So be sure to do PLENTY of research before staining a wood fence. Going with a cheaper brand of stain without doing your research can mean re-staining the wood fence in just several years. Another thing to consider is the color of the stain and how it will look on your fence. If possible, try and get a sample of the stain prior to applying it to the whole fence. Choose a stain with UV protection to slow the destructive effects of sun. Look for a product that has fungicide. Stains come in a range of colors and pigmentations. Some provide more coverage, but all allow the wood’s grain to show. Stains are classified as semi-transparent, penetrating or solid. Before you start staining, clean your fence. Staining won’t go well if you try to paint over mildew and dirt. After you wash the fence, allow it to dry for a few days. A light setting on a pressure washer does a great job of cleaning. The scrubbing exfoliates the wood, revealing a fresh layer primed for absorbing stain. No pressure washer? Read our post on money-saving cleaning solutions you can make yourself. Using the roller, dip into the stain. Apply in an even coat. Work from top to bottom. Starting at the top helps prevent drips. After completing a 3-foot section with the roller, work the stain in with a brush. Work the product into corners. If you have a partner, the work will go more quickly. One person applies the stain with the roller, the second follows behind with the brush. Follow the procedure in step 2 using the trim roller and brush. Refer to your product directions to learn if you need a second coat. Your newly stained fence should look good for several years. Inspect the boards at least once a year. Give problem areas a touch up as needed. What should you do with an old wooden fence? At Pacific Fence & Wire, we love building beautiful fences. Get in touch if it’s time for a new fence. We’ll design the perfect perimeter for your yard. From fence installation to removal of old wooden fences, Pacific Fence and Wire has the tools and expertise you need to get the job done right the first time. Contact us today for help with your next landscaping or yard renovation project.